Well now when I bought this humble palette last weekend I never for one minute expected to have such a positive experience with it. If I’m honest I bought it simply for one colour which is the beautiful reddish brown shade in the second row on the right and I thought €2.50 was a good deal if that turned out to be nice. 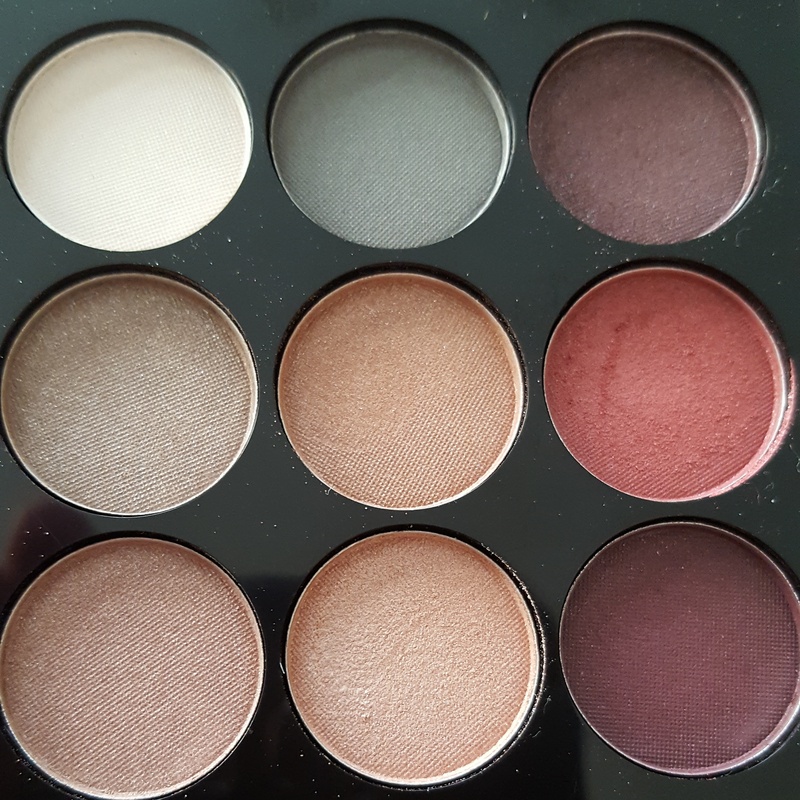 When I got home and swatched the colours I was so pleasantly surprised with the depth of colour I got from them and that reddish brown colour that drew my eye to the palette to begin with did not disappoint. Now I know some who would absolutely turn their noses up at even trying an eye shadow that is that budget but to me all make up is fair game. My make up bag is a plethora of MANY different brands both budget and high end. I’m a big believer in giving something a try regardless because you’ll never know when you’ll find a gem and I think I found one in this. Last night’s look was a blown out plum smoky eye which I went on to upgrade to a glittery finish and I’ll show you both. I started off by using a eye shadow primer and for this I used “I  stage from Essence cosmetics. This is a great primer if you don’t have a big budget as it’s less than €4 and most Penneys stores these days have an Essence stand. To create the look I used 6 out of the 9 colours starting off with my favourite colour of the palette as the high point and blending in the darker shades lower down. To create a really blown out look I always use the colours I use on top under the eye too, this really adds to the continuity of the look and this is why I always start with my eyes before I do any concealing or foundation. It means that you complete the all over look of the eye first and there’s no fall out on to your foundation and you can also tidy up any mistakes under the eye more easily. To finish the eye I used the felt tip liner from Penneys once again which I have used every day since I bought it instead of my regular Rimmel Exaggerate liner and it rocks!! So soft and easy to apply, doesn’t drag the eyelid at all and I’ve been successfully able to recreate both a thin and thicker look with it. If I was to have a little gripe with it it would be that it is difficult to remove, you have to give it a lot of welly to get it off but on the bright side of that at least you know it’s not going to wear off during the day!! Last night’s contour colour came courtesy of Sleek, I used the dark shade from the Face Contour Kit in “Light” but I used a new product for highlight and that was the “Blusher” colour from the PS Strobe Crayon Trio again from Penneys. I also picked these up when I was in there on Sunday because I was so intrigued as to what they were and how they’d look on. They come in a set of three and include a sharpener, there’s a Highlight, Blusher and Bronzer shade in the box and I’ll give you a close up view of them below. Out of the three I would say the “Blusher” colour is by far my favourite, it’s a beautiful soft pink shade that gives the skin a lovely lift when applied. I tried the “Highlight” shade with the eye look I created last night and ended up taking it off as I thought it was way too harsh, it’s bright, bright white and unless you’re a Drag Queen or on Toddlers and Tiaras nobody needs that much highlight under their brows!! I’m yet to try the “Bronze” shade because with my colouring it’s not a colour I’d naturally gravitate towards so maybe during the summer when I have some tan on it might be something I’d go for then. The texture of the crayon is nice and soft but they go on quite thickly, I would definitely not recommend applying them directly to your face, I would either use a brush or your fingers. I used my finger last night, I took some of the product off of the crayon and gently patted it on the cheek area I wanted to highlight. Pat instead of rubbing as you’ll gently build the colour this way whereas if you rub all you’ll achieve is patchy foundation with highlighty bits!! My foundation was courtesy of WetnWild, it’s their Coverall foundation in E816 Fair/Light. I love this foundation, it’s got great coverage without feeling too heavy, blends well and has a satin finish. The only negative with it is that it doesn’t have an SPF but that would be a lot to expect from a product that’s under €5!! To upgrade the look to a glitter finish I applied some of the WetnWild cream glitter eyeshadows that I picked up AGAIN in Penneys a few weeks back when I fell in love with their beautiful jewelled tones. These take a lot to work to get any colour pay off with, I had to use a lot of product in that small area to get the desired look and I think next time I might try applying some Duo glue to the area first to see if this helps the glitter to build up a little easier. 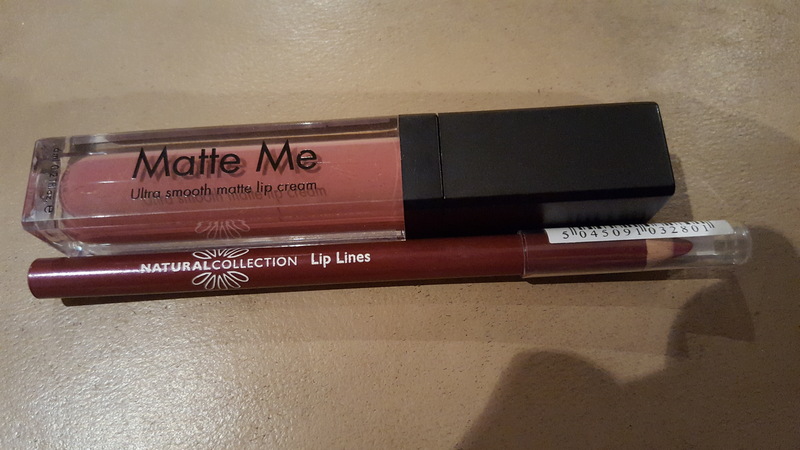 Finally the lip, this is courtesy of Sleek and their beautiful Matte Me liquid lipsticks, the shade is “Shabby Chic” and I teamed it with “Mulberry” lip pencil from Natural Collection, all of which are available in selected Boots stores and the Sleek Matte Me lipsticks are currently on 2 for €11….BARGAIN. I absolutely love this look, I’m so excited that it was created with “budget” brands and I can’t wait to create even more looks using this absolute bargain buy. Get yourself to Penneys pronto!!! Next Post Didn’t expect to be writing this review so soon! !